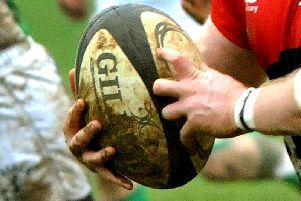 Olney’s final game of the season ended in a one-sided defeat at the hands of Lutterworth, losing 63-15. Olney kicked off and the visitors, on the counter, were awarded a penalty outside the home ‘22’. The kick was unsuccessful but receiving from the drop out Lutterworth ran the ball and scored, J. Stone touching down in the corner. No conversion placed Lutterworth 5-0 up. A penalty kick soon after put Lutterworth 8-0 ahead. From the restart Olney made inroads into the visitor’s territory,getting stronger in the scrums. Lutterworth capitalised on some pressure to set up a try under the posts, the conversion putting them 15 points clear. Olney were encouraged and a good counter attack, initiated by Olney full back Will Durden and carried on by skipper Jack Sutton took play deep into the visitor’s half. Olney were awarded a penalty from Lutterworth’s attempt to claim the ball and James Hawken converted to close the gap to 15-8, going into added time. Lutterworth claimed the next score, stretching their advantage to 22-8. Olney were served a cruel blow just on half time when from the restart the visitors kicked the ball out of defence and a freak bounce popped the ball up into the hands of M. Barber, who scored under the posts, converted by Eager to make it 29-8 to the visitors at half time. Lutterworth kicked off and a line out on the home side’s ‘22’ was well won by the visitor’s and well used to produce a try, just four mins into the half, for Stone, converted by Eager to make it 36-8. Olney’s efforts were hampered when flanker Charlie Harris was yellow carded, the absence of this vital young player proved too much. Lutterworth went on the rampage and further tries by J. Stone(2), P. Jempson(2) and J. Connor, one converted by R. Eager made the final score 63-15, bringing down the curtains on the season. It means Olney close out the season with an eighth place finish in Midlands 2 East South.